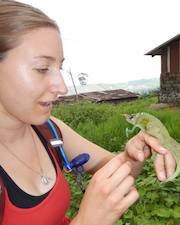 I am interested in using phylogeography, population genomics, and GIS modeling to determine the effects of volcanic mountain ranges on reptile evolution in Central African rainforests. Allen, K.E., Aviles Rodriguez, K.J., Eifler, D.A. and R. Powell. 2014. Social and environmental factors influence microhabitat selection in the brownspeckled sphaero, Sphaerodactylus notatus (Squamata: Sphaerodactylidae). Journal of Herpetology 49 (1). Diamond, K., Trovillion, D., Allen, K.E., Malela, K.M., Noble, D.A., Powell, R., Eifler, D.A. and M. E. Gifford. 2014. Individual (co)variation of field behavior and locomotor performance in curly tailed lizards. Journal of Zoology. Allen K.E. and R. Powell. 2014. Thermal biology and microhabitat use in Puerto Rican eyespot geckos (Sphaerodactylus macrolepis macrolepis). Journal of Herpetological Conservation and Biology.